The Book of Ruth in the Old Testament is one of my favorite books in the Bible. There are only four chapters in this short book, yet it tells the story of an integral part of God's plan for a Savior. If we look closely at the character of Ruth, we can also learn many lessons from her life of loss, love, loyalty, and redemption that can be applied to our own lives. 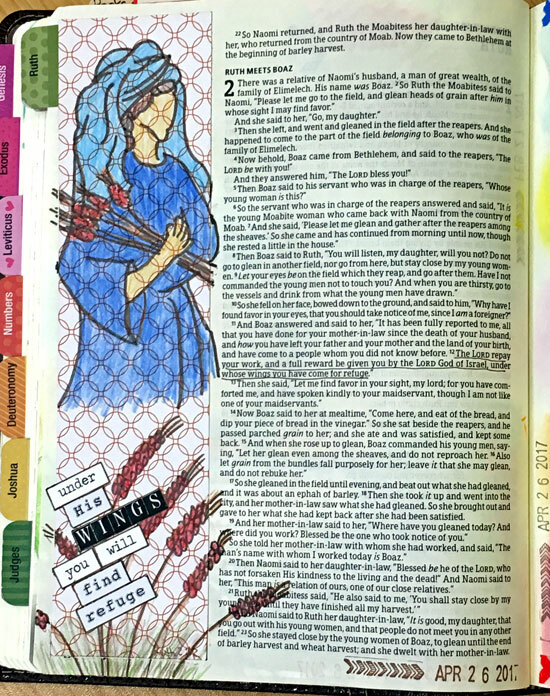 In preparation for the illustrated Bible journaling workshops I taught yesterday, I took time to illustrate this book in my journaling Bible. 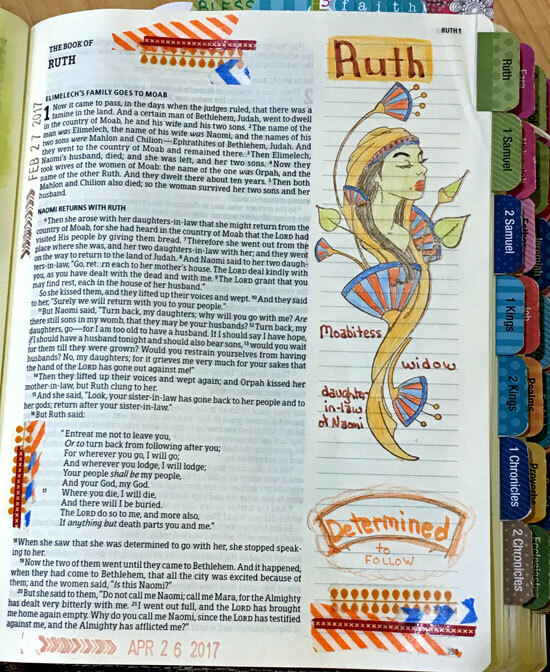 I began with a Creating in Faith stamp of Ruth and a few words to describe what we learn about her in chapter 1. 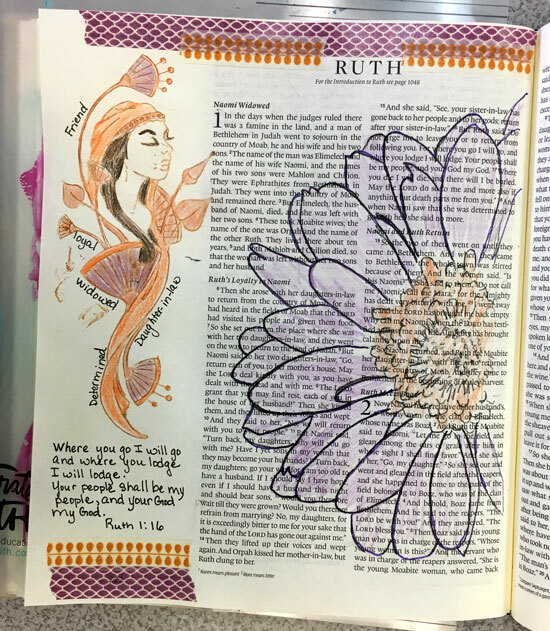 During the workshop on Saturday, one of the participants, Jennifer, used the Ruth stamp, a One & Done flower traceable, and washi tape to create this illustration for chapter 1. 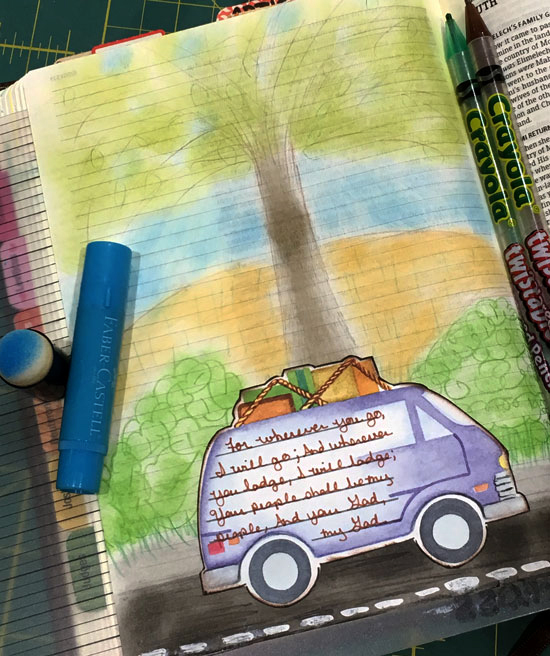 On the blank page before the book of Ruth in my Bible, I created an illustration using Gelatos, colored pencils and a car die cut I've had in my scrapbooking stash for many years. Ruth's entreaty in chapter 1 verses 16 & 17 is often used in wedding ceremonies as it is a strong commitment to follow another individual, in this case her mother-in-law Naomi. 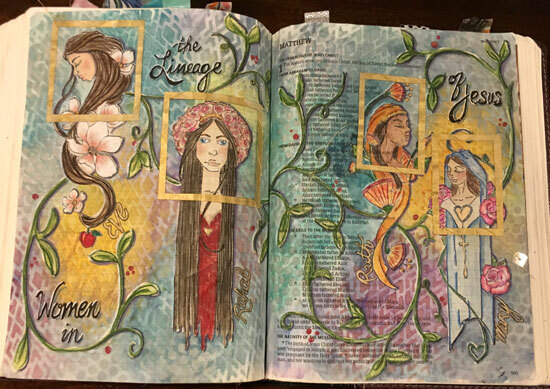 Another one of the participants in the workshop this weekend had previously shared photos of her pages. 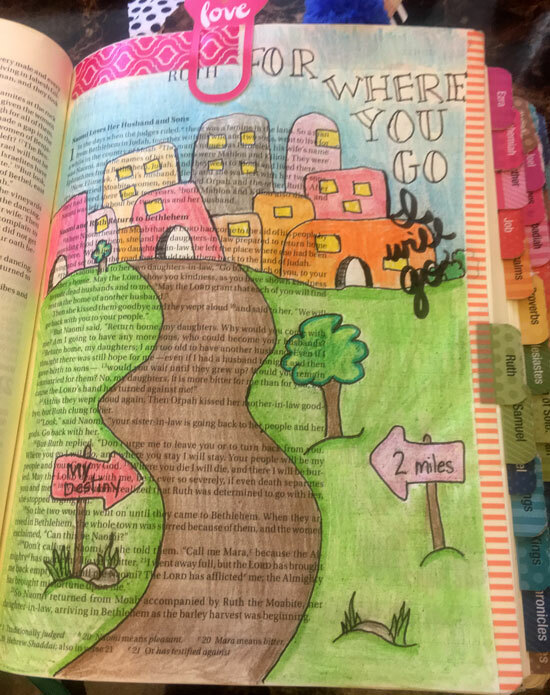 Amber's illustration for Ruth's impassioned speech to Naomi was inspired by a page she saw on Pinterest. Ruth's story continues after she and Naomi arrive in Bethlehem. She goes out to glean (pick up the barley or grain left behind after harvesting) in the field of Boaz during barley harvest. Boaz notices her and praises her for her hard work and willingness to leave her home and family to care for Naomi. He says, may "the Lord repay your work, and a full reward be given you by the Lord God of Israel, under whose wings you have come for refuge." 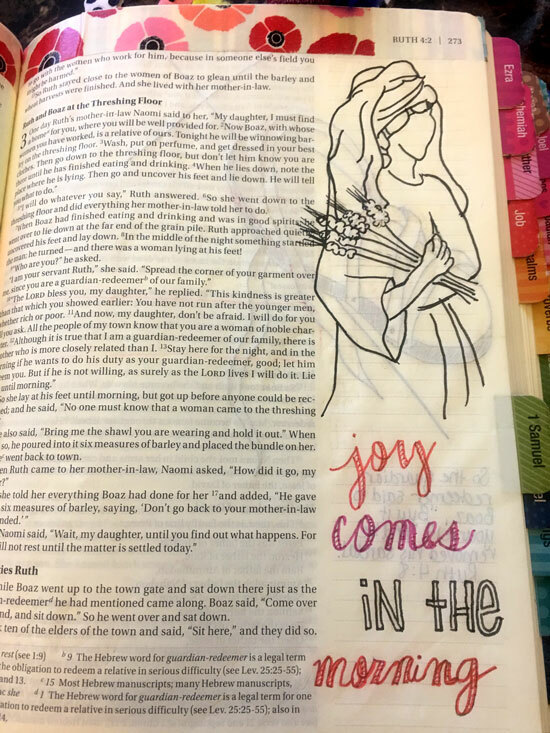 I added a piece of patterned paper to the margin before tracing an illustration of Ruth and drawing in some barley as a background for the idea I wanted to emphasize from Boaz's words. 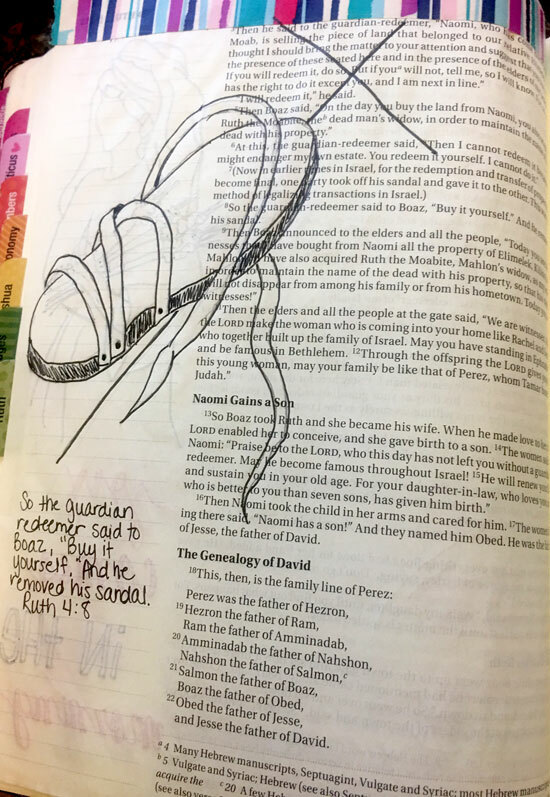 That wonderful drawing of Ruth is one that Amber drew in her margin - I simply printed a copy and traced it using graphite paper. 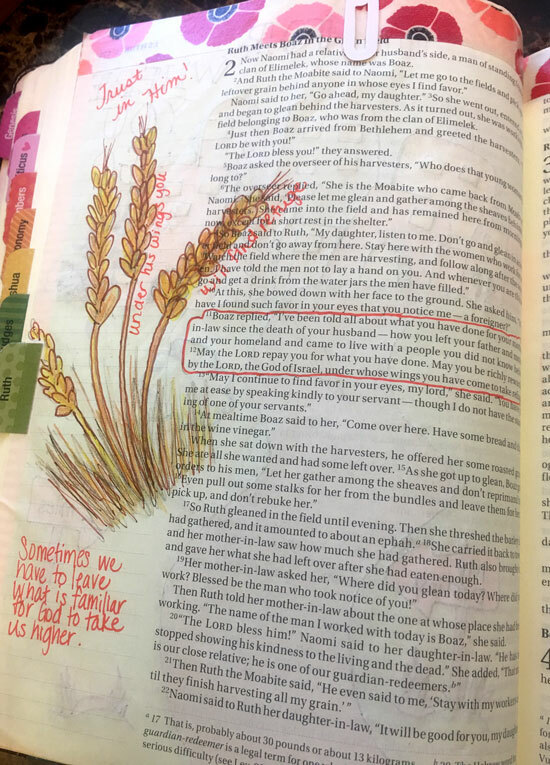 Amber also drew some barley and noted one of the lessons we can learn from Ruth's story - sometimes we have to leave what is familiar for God to take us higher. We learn that Boaz is a near relative of Naomi's deceased husband, so he is a kinsman redeemer (one who can redeem or buy back the property of a deceased relative and marry the widow to raise up seed to continue the family line). Ruth follows Naomi's instructions to go to the threshing floor and lay down at Boaz's feet one evening - an idea that sounds strange to us but worked our beautifully. When Boaz discovered Ruth and she asked him to spread his garment over her as he was a guardian-redeemer, he again praised her and said that he would. 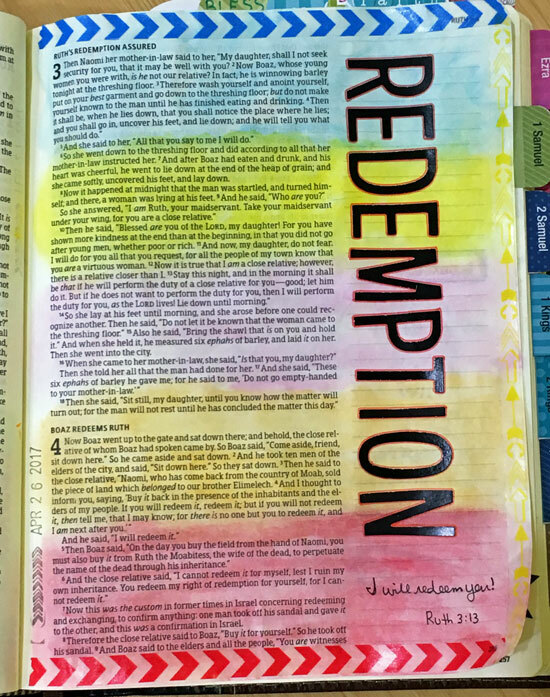 I chose to illustrate this wonderful story of redemption by creating a colorful background with Gelatos, then simply adding letter stickers to spell "redemption." Boaz marries Ruth and they have a son named Obed. After all that Ruth has gone through - the loss of her first husband, traveling with Naomi to a foreign land, working hard gleaning in order to provide food for herself and Naomi - she finally finds security in this new life as a wife and mother. 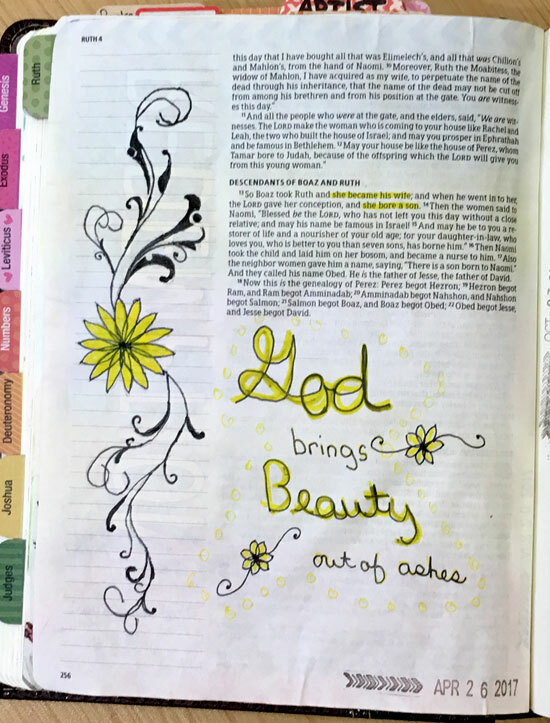 I used a One & Done traceable to add a beautiful flower & flourish to the margin to illustrate the truth that God brings beauty out of ashes. Ruth the Moabitess entered Bethlehem as a poor widowed foreigner, yet her loyalty, determination and hard work brought her to the attention of Boaz (and the Lord) who redeemed her and gave her a new life that included being the great-grandmother of King David and one of only four women named in the lineage of Christ! I've obviously simplified and shortened Ruth's story here in this blog post, and I hope I've inspired you to take a fresh look at this short book! Have you read and/or illustrated the book of Ruth? Which part of Ruth's story resonates most with you? Beautiful work on all the pages. I particularly like the little car die cut with the quote. That was a huge undertaking, and a lovely result!